Cliff Vincett remembers on the 1st March 1941, we were on patrol off Gibraltar in thick fog, when suddenly there was a sickening crunch and the ship stopped dead, just at that moment the fog started to lift. I couldn't believe it we were aground on rocks very close to the beach, and on the beach was a very puzzled small boy also arriving on a bicycle was a Spanish solider waving his handkerchief at us, in a get off my beach type of manor. Soon another solider turned up, he looked like an Officer and was shouting the odds, we had a quick check on board to see who could speak the lingo, as it happened I could speak a little Spanish and Wiggy Bennett could speak some French. Photo right Wiggy Bennett. Wiggy Bennett had a go first with his French and made some head way, but then came my turn I got the Spaniards to allow us 8hrs to get the ship off the rocks, if we weren't off the rocks in that time they threatened us with internment. So work started at once on getting the ship off the rocks, using the kedging anchor, we were lucky because it was low tide so we had a good chance if we got our finger out. Meanwhile quite a crowd was gathering on the beach, and some of the lads were throwing sweets to the kids. Photo right: Winding the ship off the rocks. 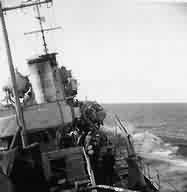 Anyway we managed to get the ship off the rocks, there wasn't any damage to the plates, but we had lost our ASDIC dome and had a very distinctive wobble which meant we had to go back to Chatham for repairs. 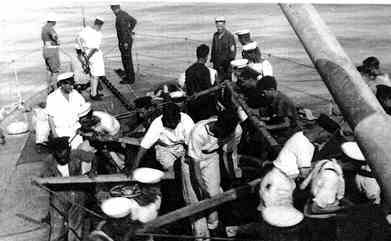 While we were in dry dock the Bismarck sank the Hood, so Force H went out to get her, all the other F class destroyers were out there as well, but Firedrake was still in dry dock so we missed that. Reg Furgusson remembers. I went into the Navy as a boy at 16, before the war started, and have got lots of memories of my time on the Firedrake, some too painful to talk about. 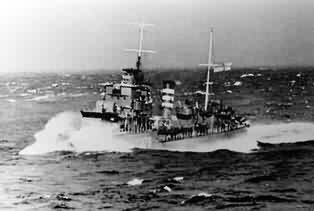 I served on the Firedrake till December 1942 then I was sent on a course so wasn’t aboard when she was lost. 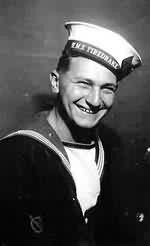 Here is some of my memories, Narvik that was a terrible time we were hit many times by shrapnel from the stuker dive bombers, how we didn’t get a direct hit a don’t know, it can only be down to the skipper, Stephen Norris, we were even being shot at from the shore by German riflemen, the ship was covered in holes a very bad time I don’t know how we got through that, as soon as the holes were patch up we were off to the Mediterranean we were very busy out there too, we were always on convoys or patrols stopping merchant ships, and having a go at the Italian fleet when we could. We nearly got hit several times by the Italian dive bombers, those pilots were very brave they kept coming at us even though they had been hit, I saw many crash into the sea, we were very lucky when we got damaged by a near miss, if that bomb had have been 20ft closer I wouldn't be talking to you now, then we went to Boston USA, to have the damage repaired, it meant we could have a bit of a break. When we were in Boston we had a Leading seaman with us Ben Saunders, who had been selected for upper yardman training and then to go to Dartmouth for officer Training, but he met a girl fell in love and got married, when the ship had had its repairs completed we left Boston for Halifax, he never turned up and we sailed with out him, to desert ship in war time is very serious we never saw him again, that is till sometime after the war I’m not exactly sure when, I was on guard at the gates at Chatham when he was marched in and locked in the cells, I asked the guard commander who I had known for years if I could talk to him, because we had been on the same ship when he went absent, and I hadn’t seen him since we were in Boston, and wandered what had happened to him. The Guard commander gave permission for me to talk to him, and this is what he told me, he got married to his girl friend, her father was a rich business man with some influence who got him a social security number, but by then America were now in the war and he got called up, and ended up in the US Navy out in the Pacific, and survived all there battles, so after the war he decided to give himself up and face the consequences. The Courts Martial took in to consideration his service in the US Navy, and gave him a dishonorable discharge so he didn't go to jail, a very lucky bloke, I never saw him again I suppose he went back to America a free man. I stayed in the Navy and served on many other ships, finishing up in south Africa, but will never forget the time and my friends who I lost on the Firedrake I think of them often. Photo left: The Firedrake in the Mediterranean. When in Boston I used to visit the local church, the vicar asked me if I had a photo of the Firedrake to put in his parish magazine. So I gave him this one of Firedrake in the Mediterranean, the picture was published in the magazine saying it was photographed in Icelandic waters, the next time I saw the vicar I told him that there had been a mistake, he said no there hadn’t, he said he had to say the photo was taken in Icelandic waters because his readers wouldn’t believe the Mediterranean could be so rough. Life on the Firedrake was quite cramped with a complement of nearly 200. You slept where you could, on the lockers or crouched over the table anywhere you could get your head down, there wasn't enough hammocks to go round, so you had to wait your turn to get one, and as far as personal hygiene, you had a bucket to wash and shave in, there wasn't any showers on the Firedrake. 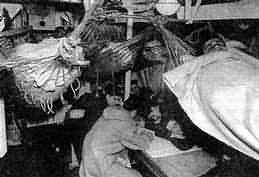 Its a good job that every body got on so well, when at sea there was water running through the mess deck and every thing was damp, clothes and bedding were constantly wet, it was the same for every one so we just excepted it and got on with our jobs, I can't remember anyone moaning.